Dylan Lupton and JGL Racing will fly this pink paint scheme in honor of breast cancer awareness Saturday at Kansas Speedway. 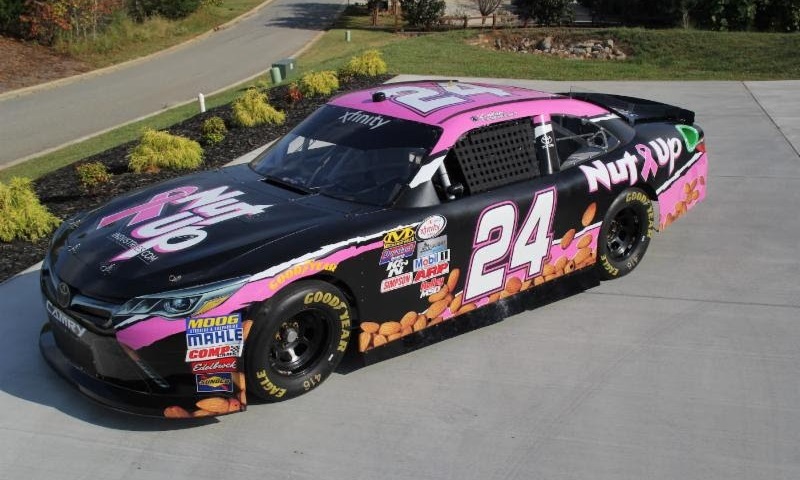 KANSAS CITY, Kan. — In celebration of Breast Cancer Awareness Month, officials from Nut Up Industries and JGL Racing announced Monday that NASCAR XFINITY Series driver Dylan Lupton will run a special pink paint scheme in Saturday’s Kansas Lottery 300 at Kansas Speedway. By submitting a $24 donation, each donor will be entered to win one of more than 50 prizes, including race-worn gloves, No. 24 pink t-shirts, JGL Racing pink crew shirts and more. Additionally, each donation made from Oct. 2-17 will be matched dollar for dollar by the No. 24 team, with donors also receiving a limited-edition pink hero card. Komen Kansas City has created a link where the public can share stories of loved ones or themselves and their battles with breast cancer, as well as being entered to become a VIP Guest of the team at Saturday’s Kansas Lottery 300. Each survivor who is entered will be invited to a special unveiling of the pink paint scheme on Thursday, where they will receive limited edition signed hero cards, meet Lupton, take photos and write their name on the hood of the No. 24 for race-day in honor of their journey.